When we heard that Berkeley scientists were doing something for Burning Man — you know, that eight-day hippie debauchery festival that stews beneath the hot Nevada sun — we were shocked and, honestly, a little disappointed. Weren’t there other, more productive things for them to be doing, like working at Lawrence Berkeley Lab on an awesomely fast network  for research scientists or continuing efforts toward creating sound zombies ? 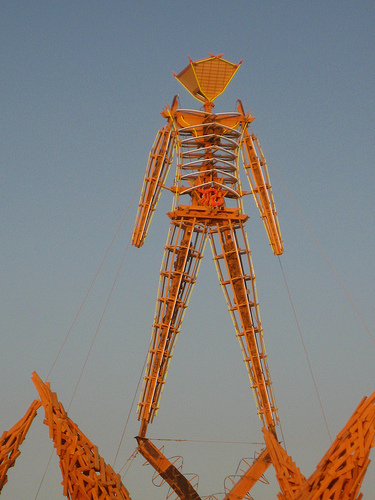 But, wait a second — will hippies and other Burning Man good-vibers even care about the time? Meh, either way, as long as this clock turns out better than the World’s Tallest Thermometer  in Baker, California, we here at the Clog say go for it, Mr. Bowers. Make us proud!